A.J. Myers was born on April 30, 1929, in Yakima, Washington. He was commissioned a 2nd Lt in the U.S. Air Force Reserve through the Air Force ROTC program at the University of Oregon on June 14, 1953, and went on active duty beginning June 24, 1954. After serving as an Admin Officer, Lt Myers attended pilot training and received his pilot wings at Laredo AFB, Texas, in April 1956. 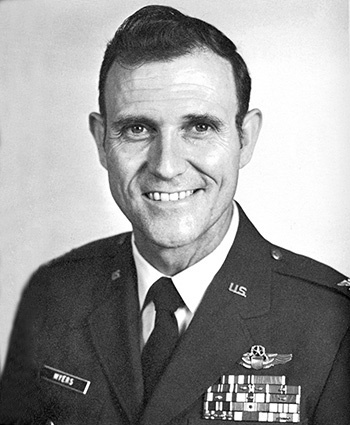 After completing all-weather interceptor school, Lt Myers served as an interceptor pilot with Air Defense Command at McGuire AFB, New Jersey, from 1956 to 1959, and then served with the 332nd Fighter Interceptor Squadron at England AFB, Louisiana, from August 1959 to August 1960. His next assignment was with the 509th Fighter Interceptor Squadron at Clark AB in the Philippines from August 1960 to July 1964. During this time, he flew combat missions in Southeast Asia beginning in April 1963. Capt Myers then transitioned into the F-4 Phantom II, and served with the 433rd Tactical Fighter Squadron (TFS) at George AFB, California, from July 1964 to December 1965. He deployed to Southeast Asia in December 1965 with the 433rd TFS flying out of Ubon Royal Thai AFB, Thailand, and was forced to eject over North Vietnam and was taken as a Prisoner of War while flying his 94th combat mission on June 1, 1966. After spending 2,449 days in captivity, Col Myers was released during Operation Homecoming on February 12, 1973. He was briefly hospitalized to recover from his injuries at Lackland AFB, Texas, and then attended Air War College at Maxwell AFB, Alabama, from August 1973 to May 1974, staying on at the college as assistant for POW Research until May 1975. Col Myers next served as Chief of the Exercise Section in the Operations Division at Headquarters Allied Air Forces Southern Europe with NATO at Naples, Italy, from July 1975 to June 1978, followed by service as Deputy Chief of Staff for Plans and Operations for 5th Allied Tactical Air Force at Vicenza, Italy, from July 1978 to July 1981. His final assignment was on the staff of the Air Force Element at Headquarters Allied Air Forces Southern Europe at Naples from July 1981 until his retirement from the Air Force on August 1, 1983. A.J. Myers died on March 27, 2002, and was buried at the Eagle Point National Cemetery in Eagle Point, Oregon. For the period 3 June 1966 to 8 June 1966: This officer distinguished himself by gallantry and intrepidity in action in connection with military operations against an opposing armed force during the above period while a Prisoner of War in North Vietnam. Ignoring international agreements on treatment of prisoners of war, the enemy resorted to mental and physical cruelties to obtain information, confessions, and propaganda materials. This individual resisted their demands by calling upon his deepest inner strengths in a manner which reflected his devotion to duty and great credit upon himself and the United States Air Force. Captain Armand J. Myers distinguished himself by heroism while participating in aerial flight as an F-4C Aircraft Commander over Southeast Asia on 31 May 1966. On that date, while conducting night tactical fighter operations in an extremely heavily defended area, Captain Myers attacked and destroyed a vital target on the hostile forces main railroad supply line. This target was highly important and Captain Myers, with complete disregard for his own personal safety, flew the entire low level route through heavy flak under hazardous night conditions to deliver ordnance on the target. The outstanding heroism and selfless devotion to duty displayed by Captain Myers reflect great credit upon himself and the United States Air Force.